just brought national hive number one from the workshop to take some photos. parked the car outside the workshop, opened up the workshop and loaded the hive into the car, get into the car to set off and what should appear from inside the hive…a honey bee!!! hive hadn’t ever been out of the workshop and didn’t have any frames in so it can’t have been a scout out looking for a suitable place for a swarm. perhaps just a good omen. hope so. 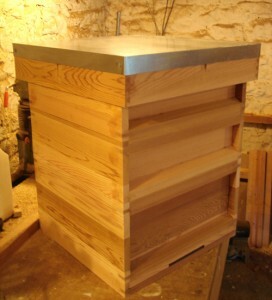 national hive number 1 completed in western red cedar…yay! built strictly to BBKA plans and comes complete with…national stand with landing board, varroa open mesh floor, entrance block, brood box, 2 supers, crown board for porter bee escapes, national roof with galvanized metal cover. made out of standard joinery red deal in order to set up the workshop jigs etc. 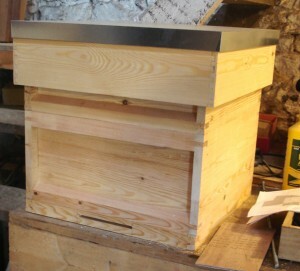 following the BBKA plans for the modified national hive. once this one is finished with all the components: varroa floor, entrance block, brood box, super, crown board and roof I should have all the jigs set up nicely to produce national hives in batches of 5 or 10 at a time. next one will be a hive in western red cedar to test out the jigs just made.